Fear, rage, courage, discrimination. These are facts of everyday life for many Americans with disabilities. The Americans with Disabilities Act (ADA), has made working, traveling, and communicating easier for many individuals. But what recourse do individuals have when enforcement of the law is ambiguous or virtually nonexistent? And how will its changing definition affect individuals’ lives-as well as their legal actions-in the future? What is life like in post-ADA America?Voices from the Edge seeks to challenge the mindset of those who would deny equal protection to the disabled, while providing informative analysis of the intent and application of the ADA for those who wish to learn more about disability rights. Giving voice to the many types of discrimination the disabled face–at a small Southern College, in the Library of Congress, on a New York City sidewalk–while illustrating the personal stakes underlying legal disputes over the ADA, this collection offers unparalleled insight into the lives behind the law.Contributors:Joan Aleshire on disability and the eye of the beholder. Achim Nowak on disclosing HIV. C.G.K. Atkins on being an academic liability. Stephen Kuusisto on hope without the tenure lifeboat. Leonard Kriegel on wheelchairs vs. NYC sidewalks. John Hockenberry on trying one’s luck at public transit. Joan Tollifson on a license to drive disabled. Shawn Casey O’Brien on the blue beacon of accessibility. Jean Stewart on sign language in the ER. 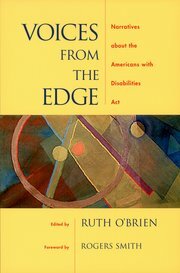 Ruth O’Brien on everything you wanted to know about the ADA.